Alex is from Louisville, CO and participated in the 2014 Korea summer and 2016-2017 Korea academic year programs. 334 days, 11 hours, and 25 minutes after my initial departure, I find myself back in Seoul, South Korea; the city that was my home for 268 days, 10 hours, and 20 minutes. At first everything seems just as I left it, nothing changing, everything the same. I can still effortlessly navigate the subways by memory; I easily remember the location of my favorite candy at a local convenience store I frequented; and the stench of kimchi wafting in the streets brings back fond memories of the morning commute. However, as I walk through the crowded streets of Hongdae, I can see that somethings have indeed changed. A building that used to be a pale yellow is now a bright blue, the local kimbap restaurant is now a cell phone accessory vendor, and a whole new batch of street performers line the streets. Perhaps the ones from last year were finally scouted and are now making it big? I sincerely hope the best for them. My longing to again see my host families after one long year is what really brought me back to Korea. Throughout the last year we have kept in on-and-off contact, sometimes going two entire months [without speaking], too busy to talk to one another, and then suddenly flip-flopping and speaking daily for three weeks straight. Ultimately though, it almost feels as if I never really left. My host mother still remembers my favorite meal, my host brother still comes home everyday and tells me about his adventures in elementary school, and we stay up all night just talking about what has changed in the last year and reminiscing about old memories together. However, the best part is just speaking Korean all day, everyday. It feels just like old times. Speaking Korean regularly after about a year is kind of like finding an old, well-loved shirt in the closet and then suddenly wearing it out. At first, it is kind of stiff, and maybe even a bit uncomfortable or awkward. However, after a day or so, it has smoothed out and feels almost as natural and warm as it once did. As a post-NSLI-Y student I still use Korean quite often, primarily at the all Korean taekwondo studio I joined during university. However, as I am not speaking Korean around the clock anymore as I was during NSLI-Y, I know that my Korean has slipped a bit since the last time I was here. “That thing when ice turns to water” I tell my host mother. “Ice turns to water…?” she questions. “Oh! You mean to melt! Nokda!” she corrects as she cracks a smile. Many of the non-daily life Korean vocabulary words have fallen through the cracks, yet I am still able to express myself well. Having my host mother correct my Korean reminds me of when we first met. Another pang of nostalgia hits. I drop in to do a surprise visit at my old high school. All of my old classmates and friends are very excited to see me. Although they are still very busy preparing for exams, they selflessly spare their lunch break to berate me with a million questions about what I’ve been doing since returning home. “How’s school?” “Where so you live now?” “Do you have a girlfriend?” After catching up with my classmates, I end up having coffee with my old homeroom teacher. She enthusiastically tells me that she will be in the same city as me in September and can’t wait to see me then. I miss my school life and friends here terribly. I spend my last night in Seoul at the Han River, arguably one of the most beautiful and brilliant places in all of Korea (at least to me). During my time as a NSLI-Y student, it was here that I often had such fond memories of weekend picnics with friends, seeing the cherry blossoms in the spring, and taking late night strolls along the bustling, vibrant riverside just as I am doing now. 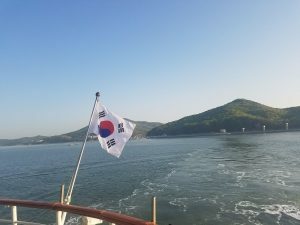 In some ways, I was actually quite nervous about coming back to Korea because I was afraid that I would be reminded of how much I loved my life here, and that leaving again would be too much to bear. However looking out on the illuminated Han River, I know now that no matter how much time has passed, no matter how much distance I put between myself and Korea, and no matter how much the city may change, the time I spent here during my NSLI-Y academic year will always be my treasure, and I will always have a home to find my way back to, here in the beautiful city of Seoul, South Korea. Fantastic piece. I loved how you put the return into a context of putting on an old shirt. 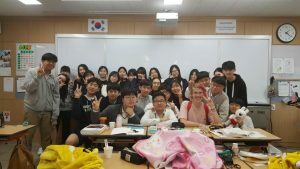 Having had a year as an exchangee in a Korean high school/host family many years ago, I can assure you that the old shirt feels comfortable even 50 years after my exchange experience. Thanks for reminding me about the verb nokda for “to melt!” That is definitely a vocabulary that I had forgotten.